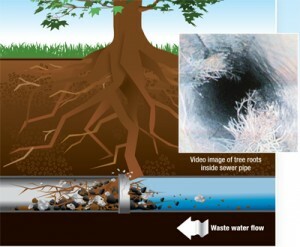 Tree roots in the sewer line is a common plumbing problem in New Jersey. Usually a homeowner will find the problem because the tree roots will cause a clogged sewer line. Snaking can very often clear the line adequately only temporarily. 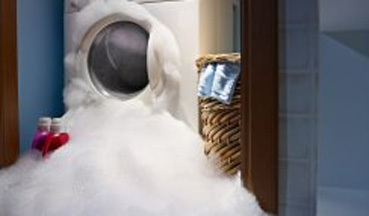 Usually after a few weeks or months the homeowner will find himself with a clogged sewer again. Snaking the line may remove any debris that is stuck to the roots and causing the pipe backup, but the roots remain to catch on to more debris and clog the sewer line again. An experienced NJ plumber will perform sewer camera inspection, showing exactly what and where the problem is. Once we know that the problem is tree roots, there are several methods to remove them, including high pressure sewer water jetting and traditional sewer repair service. Below is a cool visual showing how tree roots can grow and break into a sewer line causing a clogged sewer line and require NJ sewer cleaning and then NJ sewer line replacement or NJ sewer line repair. Sewer line repair is often not possible when the root has damaged the sewer line pipe. In such a case your only option is to do sewer replacement to replace a portion of the sewer line; either the traditional way with sewer excavation or with trenchless sewer repair. The tree roots can grow into the sewer line pipe, the sewer cleaning will usually clear them out and ease the clogged drain but if the sewer pipe was damaged then sewer line repair or sewer line replacement is immediately necessary. Another plumbing problem is that sewer cleaning may clear the tree roots growing in the sewer line but after some time the tree roots may start to grow again in the sewer line and clog the sewer line again so in that case sewer line replacement and protection may be the best option. 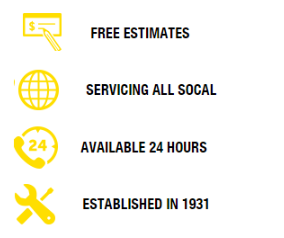 We provide 24-hour sewer service in NJ for any emergency sewer repair or sewer cleaning in NJ. Whether you need a NJ plumber for an emergency sewer cleaning or a planned sewer repair we are here to provide professional long-lasting solutions. Call us at 201-645-0888 today for the best NJ plumbing service.